A growing number of PC makers are planning to incorporate Alexa into their machines, and that growth could be set to seriously kick up a gear with Amazon’s announcement that three big ODMs are going to offer four new white-box (unbranded) reference designs which come with Alexa built-in. ODMs are original design manufacturers that provide PC designs for other vendors to brand and use, so you can see how this could spark a fresh influx of Alexa-toting laptops. They will join the models already being pushed by Acer, Asus, Lenovo, and HP which we heard about at the start of the year (indeed, Acer is already shipping Spin notebooks with Amazon’s digital assistant pre-installed). The ODMs in question are Wistron, Compal, and Quanta, and of the four white-box designs (spotted by VentureBeat), three are convertible notebooks, plus Wistron is also producing an all-in-one PC. All these products are built to deliver a full ‘far-field Alexa experience’ complete with appropriate microphone arrays to ensure your voice commands are picked up (hopefully). Wistron’s all-in-one sports a 27-inch UHD display, an Intel Coffee Lake S processor, integrated graphics, 32GB of system memory and a 128GB SSD. So it isn’t short on grunt, and it boasts a Full HD webcam with infrared, four MEMs microphones, and a pair of stereo speakers. 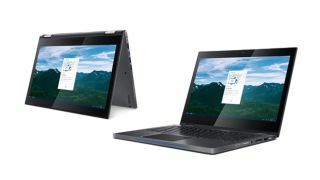 The firm’s take on a convertible notebook boasts a 15.6-inch Full HD touchscreen, and Intel Kaby Lake R processor plus 8GB of system RAM, and again four MEMs microphones. The 48Whr battery gives it a claimed life of eight hours. Compal’s convertible also has a 15.6-inch Full HD touchscreen and four digital microphones, with more extensive battery longevity at 13 hours, and a fingerprint reader thrown in. As for Quanta’s hybrid laptop, that runs with a smaller 14-inch Full HD display, and again, four digital microphones, and it’s designed for taking on the road with 18 hours of battery life (and it also has boosted security with a fingerprint sensor). Clearly, then, Amazon is making a big push to get Alexa on more laptops and PCs in general, making it easier for PC manufacturers out there to utilize a suitable reference model for their own products. Could we even see a future where Amazon takes a design like one of these and sells it under its own brand, as an actual ‘Alexa laptop’? That’s not what this move is about at the moment, but it’s an interesting thought to mull looking down the line.